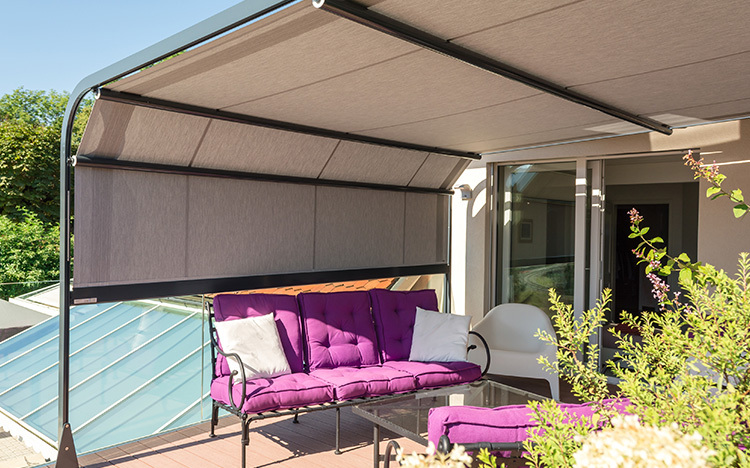 Enjoy the outdoors in sunshine or rain: STOBAG terrace awnings are hardwearing and provide extra space in the open air. 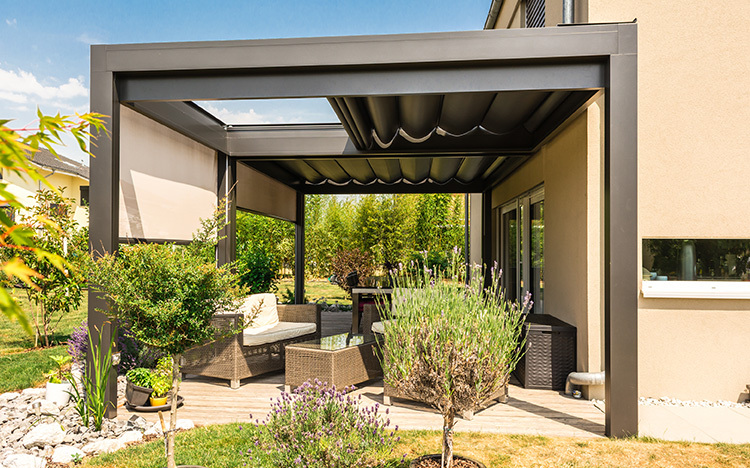 Terrace awnings offer a lot of benefits for fresh air fans. Frontal support makes the systems very stabile. With sufficient incline and fitted with a waterproof cover they not only provide shade but are also ideal for use in the rain. There are a number of product solutions to choose from depending on the particular application, desired dimensions and aesthetic appeal. 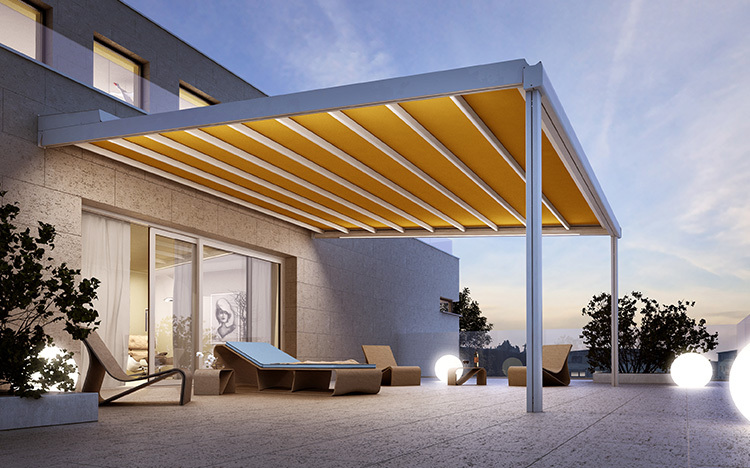 Pergola awnings, for example, give your terrace a Mediterranean feel. 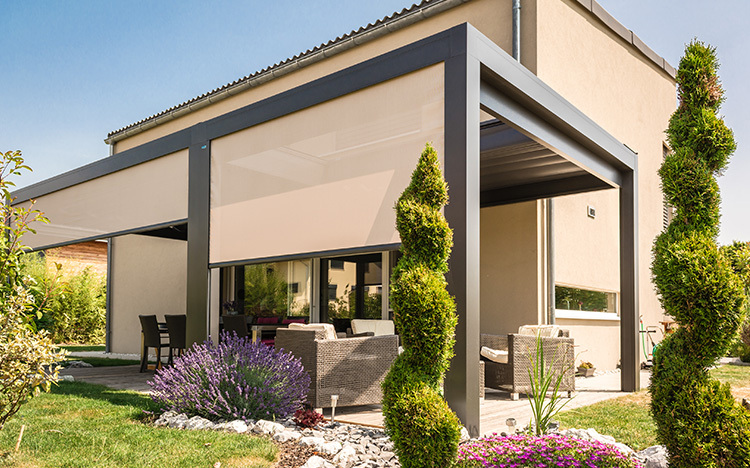 Terrace awnings, which combine horizontal and vertical shading in one system, are also available. 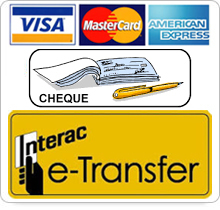 The standard electric drive ensures easy use and can be automated via various control systems. STOBAG terrace awnings are tailor-made and offer a full range of options. Continual quality control and the use of tried and tested brand fabrics with up to 100% UV protection guarantee maximum safety and functionality. 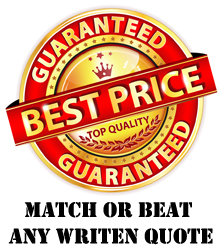 Let yourself be inspired and choose from over 400 cover designs and thousands of colour combinations. 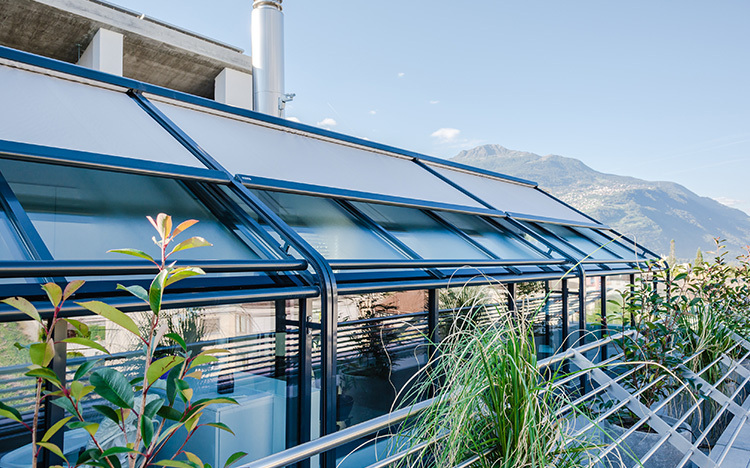 The ARCADA was designed specifically for combined shading of roof and vertical areas of glass annexes and conservatories. This innovative system not only protects against the sun and glare but also against prying eyes. The aluminium guide rails can be adjusted to any angle up to 90° using one or more bends. The proven gas-spring cylinders inserted into the front rail ensure constantly high fabric tensioning – in any position. 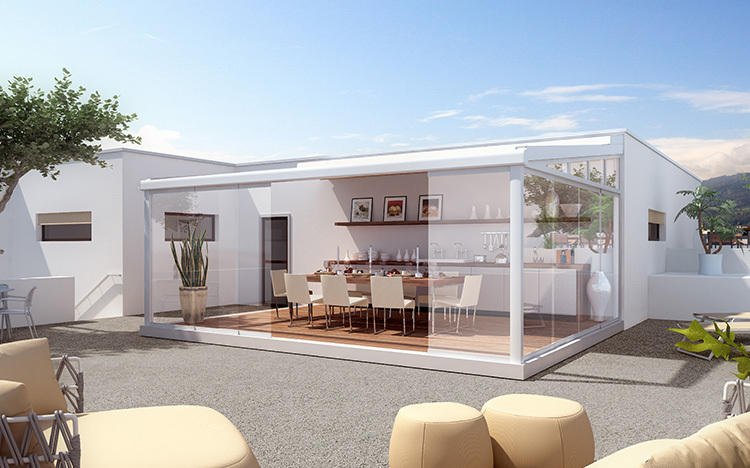 With the new STOBAG pergola RIVERA P5000 you can create generous free space in an elegant design on any terrace. 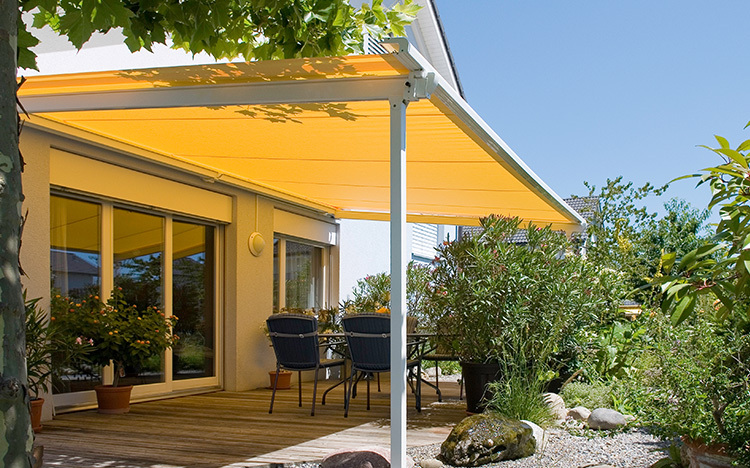 The integrated folding awning creates cool shade in sunshine and protects against damaging UV radiation. When it rains, the tightly stretched RESISTANT fabric guides the water in a controlled manner to the run-off system in the front area. Expand the open air pleasure with convenient options. The power-saving LED lighting conjures up a nocturnal atmospheric ambience on your terrace. With the variable sliding glazing system you benefit from additional protection against wind and weather and hence extends your fresh air season – panorama view included. 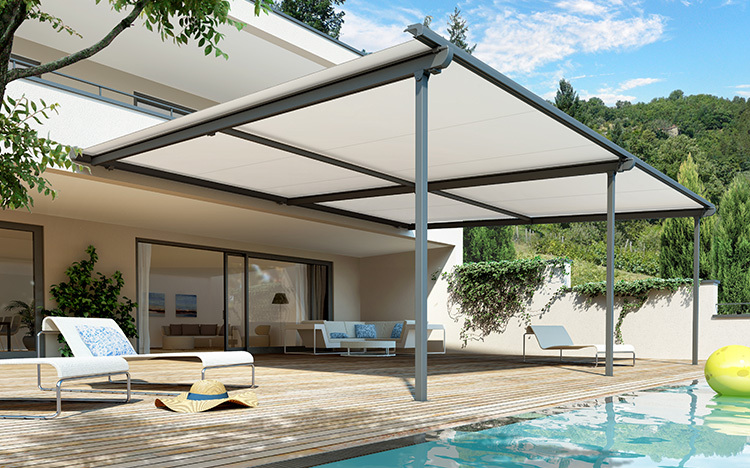 Thanks to the high-quality materials and corrosion-resistant, powder-coated aluminium profiles, the RIVERA P5000 pergola awning offers outstanding durability and reduced maintenance. The flame-resistant polyester fabric (fire protection class B1) with dirt-repellent surface is the excellent choice for private areas as well as outdoor restaurants at hotels and restaurants.